The PC-905 is supplied with a full numeric keypad and optional connection to a remote base or floor scale. 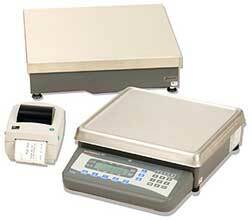 Remote Base Interface: Interface PC-905 to a single remote floor scale, analog base, or Avery Weigh-Tronix QDT base. Remote base capacities available from 50 lbs – 200,000 lbs. Wallmount Display Bracket: Existing display assembly can be removed from base and mounted onto wall with use of display cable extension from 5′ to 10′.